I received a sample of the [tag]100% Organic Partida Agave Nectar[/tag] some time ago and it has been quite a journey as I developed [tag]recipe[/tag]s for this interesting [tag]product[/tag]. The [tag]Partida Tequila company[/tag] makes their [tag]tequila[/tag], as you might expect, from [tag]blue agave plants[/tag], a succulent that dwells in the arid lands around [tag]Jalisco, Mexico[/tag]. One can also make [tag]nectar[/tag] from these interesting plants and let me assure you, this nectar is quite a wonder. For one, it is sweeter than table sugar. It looks like a thin honey as it is less viscous. It tastes a bit like honey although it’s flavor is not a dominant thing. The most important thing, ok – to me, is that it is fantastically low on the g[tag]lycemic[/tag] scale. Get this, pure [tag]agave[/tag] nectar has a GI of 11 while white sugar is 100. A 10th of the [tag]glycemic impact[/tag] of sugar! Today I have two drink recipes and one food recipe to show you just a very few possibilities for working with [tag]agave nectar[/tag]. The first is one I tested just today. Its a nod to the south of the border origin of the nectar as it uses [tag]chocolate[/tag] and it’s consistency is something [tag]Montezuma[/tag] would love – thick and potent. 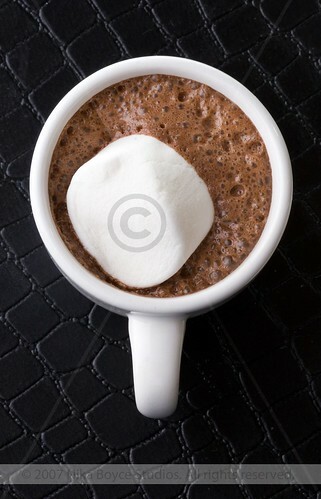 Combine agave nectar, cinnamon, chocolate powder and hot water in a small sauce pan over medium heat. Mix until incorporated. 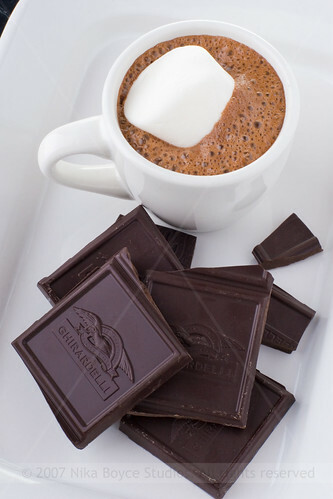 Add [tag]Ghirardelli chocolate[/tag] squares and then the fat free 1/2 and 1/2, heat until its smooth. Froth with an immersion blender. Do not not add [tag]marshmallow[/tag]s if you want to keep the GI low. I had my rather fussy toddler give it a try and she loved it, even though it was made with grown-up unsweetened chocolate. 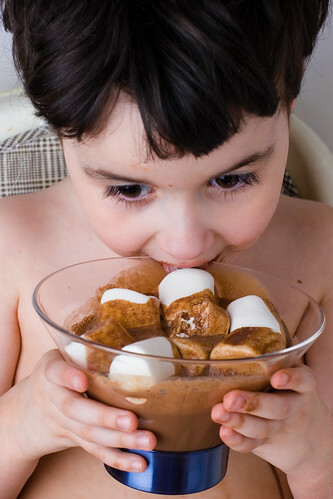 She liked it with and without the marshmallows. The second recipe is one that you will see all over the web and I will repeat it here but, since I do not drink tequila, I have not taste tested it. Its not hard to imagine that it is delicious! Mix it all up in a bucket (or your favorite container), and serve over ice or chilled in a margarita glass. The third and final recipe is one I developed a couple of weeks ago and, as you likely remember, covered in more detail at this post here. In a small pan over medium heat, combine the scooped out pulpy seeds of the 2 passion fruits, the sliced apricots, 1 tablespoon of the Agave Nectar, 1 teaspoon of the fig vinegar, and 3 tablespoons of water. Simmer this down until it thickens to your desire consistency. You may need to add some water to thin or simmer longer to get it thicker, up to you! I put the syrup through a strainer to get rid of most of the midnight black seeds (which have these very interesting little divots across their surface) as they didn’t seem very edible to me. When I served this all up, I put some agave nectar in the [tag]oatmeal[/tag] and stirred it up. 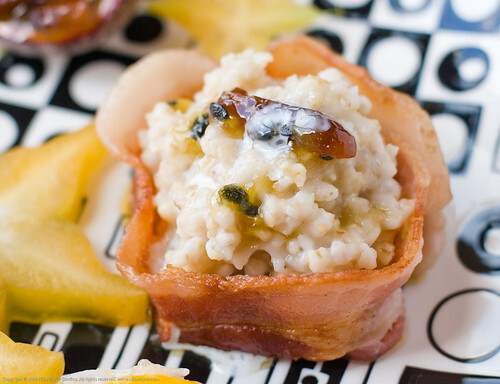 I put the oatmeal into the bacon round (secured with a bit of wooden skewer) and then drizzled it with the [tag]gastrique[/tag] and added a bit of apricot. The remainder of apricots were put into a passion fruit rind. Do NOT eat raw passion fruit rind (has cyanide compounds in it). I hope that these three recipes opened your eyes to the possibilities of agave nectar. I plan on doing more work with chocolate because when I was making the hot chocolate, I saw how perfectly agave nectar married/melded with the chocolate (I feared it might seize but it didn’t). Low GI chocolate sauce, oh how thou callest my name. Just today I had someone e-mail and ask if I had tried agave, and I’ll send her this post. Great job. I have been meaning to try it for quite a while, but just haven’t gotten to it, but you’ve inspired me for sure. Eagerly awaiting your recipe for low G.I chocolate sauce! Kalyn: wow, I didnt see this comment until late tonight (something must be going on with my email).. I have run out of the agave! I need to get some more because I have grown to like it in my tea. Once I get some, I will make the chocolate sauce for sure. Thanks so much for the margarita recipe. I could not find that Agave you wrote about but I did find another one. The taste is excellent. Do all the agave sweeteners have the same GI load/index? I am trying to figure out the GI for the drink. 0 for the lime juice, 11 on the agave ? on the tequila. I added a little natural orange extract for the flavor.